Sooner or later, everyone needs a vacation. I know it sounds strange, but even when your life is filled with adventures, you still need a break once in a while. Most people look for adventure on their vacation. I do that all the time, so it would hardly be a break for me, now would it? My challenge is finding the right sort of break from a life of adventure. If I spent my entire vacation doing nothing, it would be a change, but it would still get pretty boring. The secret is to find a balance, and I managed to do that this summer. I took a short trip to Europe and made a new friend in Bruges (hello Chateau) but that is another story. By the end of the trip I’d had enough travel and for the rest of the summer, I’m pleased to say, I did absolutely nothing. I suppose it isn’t exactly correct to say I did “absolutely nothing”. I read books, relaxed in the sun, swam, ate wonderful picnic lunches in the garden, and slept in far later than usual. If you think about it, that is really quite a lot, but at the same time it’s sort of a lot of nothing. I loved every minute. It really was a wonderful vacation, but by the end I was looking forward to getting back to work; that is, back to my adventures. Of course, I had to meet my new grade 3 friends first, and tell them about my adventures. Part of me wanted to stay and get to know them better, but when my traveling companion announced that he was going someplace I had never been, I simply couldn’t resist. I’ve always wanted to see the sights of New York, especially the Statue of Liberty. It is rather strange when you think about it. I had seen a replica of the Statue of Liberty in Las Vegas, and one in Paris, but I had never seen the real one in New York. So when my traveling companion said I was finally going to see the real Statue of Liberty, I was very excited. I soon discovered there is a catch. It is easy to get close to the Statue of Liberty in Las Vegas. The statue in Paris is on a small island, but you can walk over a bridge to get to it. The original Statue of Liberty in New York is on an island too, but this one is in the middle of the harbour, far from the shore. My traveling companion suggested that the easiest way to see it up close would be to take the Staten Island Ferry. The Staten Island Ferry is another thing that I’ve always wanted to ride, so I said “great”. The view of the Statue of Liberty from the Staten Island Ferry was everything that I’d hoped for. On the return trip it was getting dark, and I could see the light shining from the torch she is holding up high. I was a bit jealous though when I saw a sail boat that was much closer than I was. Maybe next time I’ll see if I can do that. You never know! Liberty wasn’t the only interesting thing I saw in New York Harbour. The ferry also goes near Ellis Island. Long ago, Ellis Island was the first place people landed when they came to America. I almost considered it, but they told me the ferry didn’t stop there anymore. It’s really just as well, because I’m having too much fun with my adventures to settle down in any one place. Maybe another day I’ll go to Ellis Island, but not this time. On the return trip I had a great view of Manhattan, including the Empire State building. Some day I’m going to have to try to climb that building. If an ape like King Kong can climb it, then I certainly can. After all, I’ve already climbed the Eiffel Tower. I didn’t have a chance to get to the Empire State building this trip, but maybe next time I will. As we were pulling into the terminal, I saw another famous sight; the Brooklyn Bridge. It actually sounds a lot more exciting than it looks, but I was still glad for the chance to see it. Someone even tried to sell it to me, but I really couldn’t imagine what I’d do with it, so I decided to say no. It did seem like a very reasonable price though, and I’m still wondering if I should have gone for it. What do you think? When the ferry docked, we took the New York subway back to our hotel. It was crowded, and very hot. My thick fur made it especially uncomfortable for me, but I thought the people looked awfully hot too. We rode the subway right to Grand Central Station. After all that excitement, my traveling companion wanted to get a good night’s sleep, but there was no way I was going to pass up a chance like this. While he slept, safe in bed, I went prowling around Central Park. I don’t suggest that you try it, but I can take care of myself; my claws are very sharp. I’m also pretty good at hiding, so I don’t think anyone even saw me, but I saw them. The next day my traveling companion had to go for another one of his all day boring meetings, so I used the time to explore the office. They had some rather strange and interesting things in there, and I made several new friends. 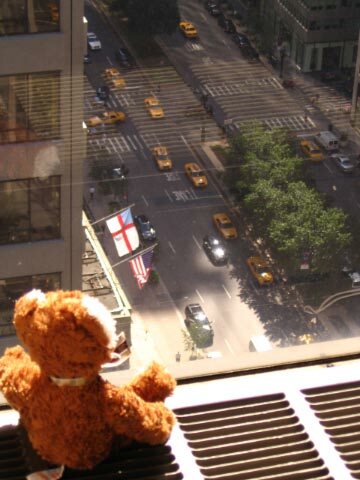 When I got tired, I just sat by the window on the 24th floor, and looked out at the city life. I saw many things, but the one thing I noticed the most was all the yellow cabs. There must be a million of them in New York City. Actually I looked it up, and there aren’t a million, but there are over 10,000, which is still an awful lot of cabs in one city.